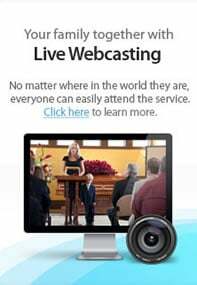 We are the nations first mortuary to offer complete real time at-need funeral arrangements on line. Everything is presented in the same manor as if you were sitting in one of our state of the art computerized arrangement offices. You will be able to see your arrangement counselor and select all funeral related items such as caskets, urns, flowers, chapels, outer burial containers, memorial markers and more in the privacy and comfort of your own home together along with your family. Now even if your family is located in different cities, states or other countries, they can all come together on line using their own internet connection. You will be able to communicate with each other as well as see and talk with your arrangement counselor just as if you were all physically in the same room. Now there is no rush for family members to secure transportation then wait until everyone arrives locally to be apart of these very important decisions. 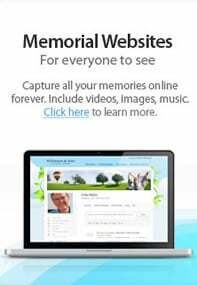 Making the funeral arrangements first online will allow more comfort and less anxiety to those that happen to be out of town at the time a death occurs. It allows for better planning both locally and for those out the area when services are known as early as possible. Accommodations can be better made with airlines, hotels, ground transportation, work and other commitments once the services are known and confirmed. As always we will be here to assist you, our family serving your family. • Step 2: click on the link below to schedule your on-line arrangement.